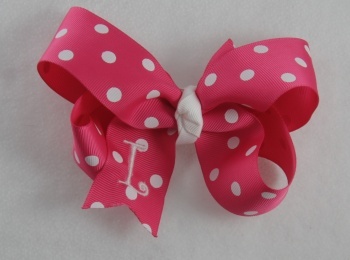 Make this bow her very own with her initial on it!. This is a Shocking Pink grosgrain ribbon that has white polka dots. A white French knot wraps the center of this bow. The front tail has one initial in white written with a Mono Curls font, this is a very hot font for the young girls- very Girly and Sassy! So just put the initial you would like in the notes section of checkout and it will be personalized just for you! The initial is 1 inch.